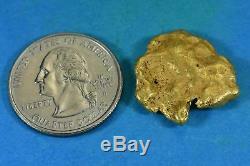 Alaskan Natural Gold Nugget weighs 10.22 Grams. Natural Gold Nuggets can have other mineral content such as silver and copper mixed in with them and are never 24kt gold. Each nugget comes to us directly from the miner in an unclean state. We remove most of the dirt and rock and tumble them to bring out it's natural shine. All Nuggets are Pictured or Partially Pictured with a U. Quarter which is 24.5MM in diameter to give you an idea of size proportion. My name is Grant I come from a 4th generation family of jewelers and gold dealers. My great grandpa Jack was a master watch maker in the San Francisco Bay area where he had 28 other watch makers working under him. In the 1930's He moved to Oroville and started his own a retail jewelry store. His son , my grandpa Roy who made gold nugget jewelry in retail store started wholesaling them and the business grew so much he opened up the company called Orocal in the mid 1960's. In the 1980's My father David was one of the first people to make and whole sale gold in quartz jewelry and Exported By ExportYourStore. 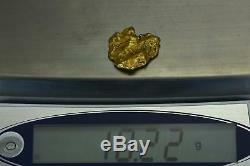 The item "#462 Alaskan BC Natural Gold Nugget 10.22 Grams Genuine" is in sale since Friday, October 5, 2018. This item is in the category "Coins & Paper Money\Bullion\Gold\Nuggets". The seller is "nuggetsbygrant" and is located in us. This item can be shipped to United States, Canada, United Kingdom, Denmark, Romania, Slovakia, Bulgaria, Czech republic, Finland, Hungary, Latvia, Lithuania, Malta, Estonia, Greece, Portugal, Cyprus, Slovenia, Japan, Sweden, South Korea, Indonesia, Taiwan, Thailand, Belgium, France, Hong Kong, Ireland, Netherlands, Poland, Spain, Italy, Germany, Austria, Bahamas, Mexico, Singapore, Switzerland, Norway, Croatia, Malaysia, Guadeloupe, Iceland, Sri lanka, Maldives, Viet nam.